Storm-damaged trees litter the east lawn of the U.S. Capitol in Washington, D.C., on Saturday. A land hurricane left a trail of destruction across the Midwest and mid-Atlantic on Friday, cutting power to millions and killing ten people. More than 450 damaging wind reports were received by NOAA's Storm Prediction Center (SPC) as the land hurricane took roughly 12 hours to race from northern Indiana to the southern mid-Atlantic coast. A land hurricane is also known as derecho, a widespread and long-lived wind storm that produces gusts to hurricane strength. The most severe derechos are given the adjective "super." Winds gusted to 91 mph (equal to that of a category 1 hurricane) at the Fort Wayne International Airport, Ind., Friday afternoon. As the land hurricane maintained its violent nature, an 81 mph gust was then measured at Tuckerton, on the southern New Jersey coast, early Saturday morning. Downed trees dominated the damaging wind reports and led to the deaths of 10 people, according to Fox News. Two boys died by a pine tree fell onto a tent at Parvin State Park, N.J.
Damage on Friday was not confined to downed trees. Power poles were also snapped, while some structures sustained damage. At least four semi-trucks were blown over by the winds on I-75 between Findlay and Bluffton, Ohio. States of emergencies have been declared in Virginia, West Virginia and Ohio. 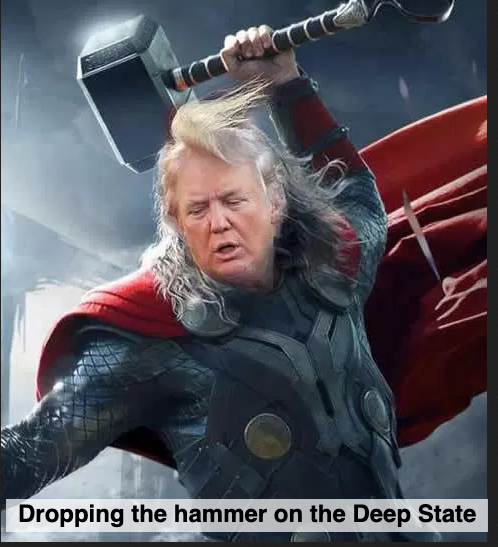 With 2.5 million in the dark, Virginia Gov. Bob McDonnell stated that his state experienced its largest non-hurricane power outage in history. 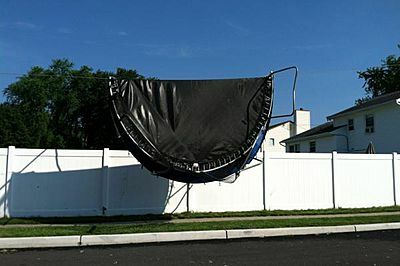 A trampoline hangs over a power line following Friday's derecho. Photo by Twitter user Tina C. Check out more shocking images of the derecho's damage in this story. Friday's land hurricane was triggered by a ripple in the jet stream and fueled by the intense heat that caused Washington, D.C., to set a June record high and Columbia, S.C., to break its all-time record on Friday. Land hurricanes or derechos typically strike the lower Midwest states once every year, according to the SPC. The occurrence of derechos, however, are quite rare across the mid-Atlantic, south of Philadelphia. On average, this region endures a derecho once every four years. One of the most recent significant land hurricanes to slam the United States occurred on May 8, 2009. This weather phenomena traveled more than a thousand miles in 24 hours from southeastern Kansas to the southern spine of the Appalachian Mountains. Destruction from the May 2009 derecho totaled millions of dollars with numerous injuries and several deaths reported. One main difference between the May 2009 land hurricane and Friday's is the number of tornadoes spawned. Forty-five tornadoes were sighted in May 2009, while there was only one unconfirmed report of a tornado on the ground in Newcomerstown, Ohio, Friday afternoon. Winds in the strongest land hurricanes can top 100 mph. The land hurricane that tore through Wisconsin and Lower Michigan on May 31, 1998, produced a 128 mph wind gust in eastern Wisconsin. Additional severe thunderstorms will threaten parts of the Midwest and mid-Atlantic later today, but a repeat of Friday's widespread destruction is not expected. With more triple-digit heat in the forecast, millions of people in the Mid-Atlantic area were without power on Saturday after violent storms with 80-mph gusts toppled trees, cut power lines and killed six people in Virginia alone. Ohio also saw up to 1 million homes and businesses without power Saturday due to the storm front overnight, and at least one person died there. Another person was killed by a falling tree in Maryland, while two cousins, ages 2 and 7, were killed by a falling tree at a campsite in New Jersey's Parvin State Park. Five other deaths in recent days are thought to have been tied to the heat wave hanging over much of the nation, and forecasters warned of more dangerously high temperatures Saturday. It should top 100 degrees in areas across 25 states, a heat scenario impacting 47 million people, the Weather Channel's Julie Martin said on NBC's TODAY show. The storms cut power more than 2 million homes and businesses across the Mid-Atlantic area -- including 1.5 million in the Washington, D.C., area, NBCWashington.com reported. "We have more than half our system down," said Myra Oppel, a spokeswoman for Pepco, a utility serving the D.C. area that had 400,000 customers without power after 80 mph gusts knocked down trees and power lines. "This is definitely going to be a multi-day outage," Oppel added -- not good news for those relying on air-conditioning to deal with the muggy, triple-digit temperatures this weekend. An uprooted tree blocks a street in the American University neighborhood of Washington, D.C., on Saturday. Repairing damage "is a monumental task," added Ed McDonough, a spokesman for the Maryland Department of Emergency Management. "This is something that is going to take days, not hours." Water restrictions were ordered in Montgomery and Prince George's counties because the storms had knocked out power to its filtration plants and other facilities. And the high heat prompted the AT&T National golf tournament at the Congressional Country Club in Bethesda, Md., to close the competition to spectators and volunteers on Saturday. Play was delayed for hours as crews cleaned up fallen trees. In suburban Washington, residents were told to call non-emergency phone numbers or go to fire and police stations if they needed help because even 911 emergency call centers were without electricity. 6 deaths in D.C. area Trees were blamed for two deaths in Springfield, Va. — a 90-year-old woman in her home and a man driving a car. Gov. Bob McDonnell in a statement said four others were killed by falling trees in Virginia, which saw its largest non-hurricane power outage in history. Some 250 roads in Virginia were blocked by trees, the state said. In addition, a park police officer was injured by an uprooted tree in northern Virginia, and an 18-year-old man was struck by a power line. He was in stable condition after receiving CPR. Damage in the D.C. area included a rooftop blown off a 7-story apartment building, and dozens of damaged homes. Widespread power outages were reported from Indiana to New Jersey. On Friday, the nation's capital reached 104 degrees — its hottest June day on record. The heat is also suspected to have been the cause of the deaths of two young brothers in eastern Tennessee, Reuters reported. The boys, aged 3 and 5, had been playing outside Thursday. The younger boy died Thursday, and the older boy on Friday afternoon, according to Eric Blach, administrator for the Bradley County Medical Examiner's Office. In Kansas City, Mo., city health officials said Friday they were investigating the deaths of three area residents, including a baby boy, to determine if they were heat-related, according to Reuters. Early Saturday, the National Weather Service issued excessive heat warnings for parts of Maryland, Delaware, Pennsylvania, Washington, D.C., Virginia, North and South Carolina, Georgia, Indiana, Ohio, Illinois, Missouri, Kansas, Kentucky, Alabama, Tennessee and Arizona. It said the temperatures could get "dangerously hot."